The grill is a great way to cook any piece of fish, but salt-crusting the fish and then wrapping them in a banana leaf takes things to a whole new level. Engulfed in aromatics like thyme, lemongrass and ginger, this dish is sure to please at your next cookout. Morton® Kosher Salt is the perfect choice for your salt crust. The salt crystals are the ideal size to create a crust to seal in the fish’s juices. 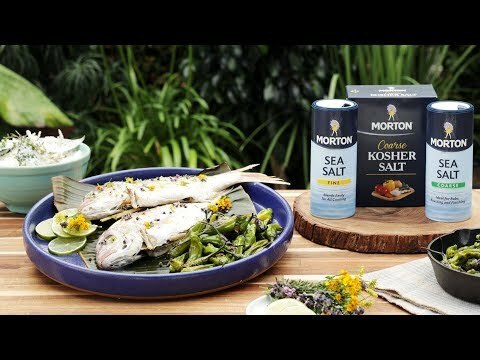 Finishing with Morton® Coarse Sea Salt add a satisfying crunch against the tender fish, while bringing out the natural flavors. Line a large rimmed baking sheet with foil or parchment paper. Lay down banana leaves. In a large bowl, mix together thyme sprigs, sliced lemongrass, sliced ginger, bay leaves and garlic. In another bowl, mix together Morton® Kosher Salt with 1/2 cup of water until it resembles moist sand. Add half the thyme mixture. Place snapper on prepared banana leaves and fill with remaining thyme mixture. Gently wrap the banana leaves around each fish to create a pouch, securing with toothpicks. Cover fish with the aromatic salt mixture, lightly packing it to completely cover the fish. Grill fish in banana leaf packages for 15 to 20 minutes, until internal temperature reaches 135 degrees Fahrenheit. Remove from the grill and let stand for 5 minutes. Carefully crack the top salt crust with a spoon and discard. Using a fish spatula, carefully transfer the top fillet to a platter. Flip the fish over and repeat the process. Drizzle with olive oil and sprinkle with Morton® Coarse Sea Salt. Serve warm with grilled Shishito peppers. For Grilled Shishito Peppers: Preheat a grill to 450 degrees Fahrenheit. In a bowl, toss together shishito peppers, olive oil and salt. Place on the grill and char until blistered. Remove from heat and serve hot with a drizzle of fresh lime juice and fresh lime zest. Finish with Morton® Coarse Sea Salt.